Following more than a week of deliberations, jurors reached a verdict Monday in the trial of a Navy petty officer accused of driving drunk and losing control of his truck, which plummeted over the side of a transition ramp to the San Diego-Coronado Bridge and landed in Chicano Park, killing four people. 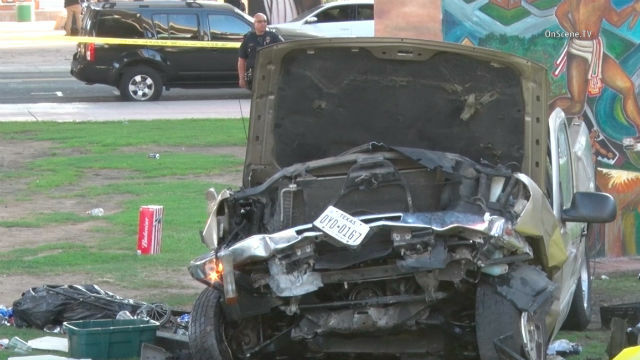 Richard Anthony Sepolio, 27, is charged with gross vehicular manslaughter while intoxicated, DUI and reckless driving for the Oct. 15, 2016, deaths of Annamarie Contreras, 50, and Cruz Contreras, 52, a married couple from Chandler, Arizona; and Hacienda Heights residents Andre Banks, 49, and Francine Jiminez, 46. Seven other people were seriously injured. The verdict will be read at 9 a.m. Wednesday at the San Diego Central Courthouse to give parties involved in the case — some of whom are from out of state — time to travel to the hearing. Courthouses are closed Tuesday in observance of Lincoln’s birthday. The jury began deliberating 10 days ago in Sepolio’s trial. Deputy District Attorney Cally Bright told the panel in closing arguments that Sepolio chose “to drive irritated, impaired and impatient.” Prosecutors argue that in addition to having drinks prior to getting behind the wheel, Sepolio was arguing with his girlfriend over the phone just moments before losing control of his truck on the bridge. The defendant said he remembered being on top of a freeway barrier looking down, then waking up in the park and being pulled out of his truck. Sepolio said his memory was mostly “cloudy” about what happened after his truck plunged into the crowd below. On the stand, he denied arguing with his then-girlfriend on the phone just before the crash, but admitted on cross-examination that he’d just left a lunch with a female Navy colleague where “the idea was to go out and have a good time.” Sepolio testified he had a glass of alcoholic cider and a glass of wine at lunch before heading back to Coronado. In his closing argument, defense attorney Paul Pfingst said multiple breath and blood tests showed that Sepolio was not under the influence of alcohol the day of the crash. One blood sample was taken to a California Highway Patrol office and wasn’t tested for a year, Pfingst told the jury.